Great Adult Dance Classes in Reading PA! Looking for adult dance classes in Reading Pa? Perhaps you have been in the market for dance lessons but are not sure where to start or what type of dance lessons are right for you. Well, Swing Kat Entertainment has just started holding adult dance classes in Reading Pa! These classes started in July 2015 with a sold out class of students! Students range in age, but you will find ages 25 – 60 in most of our classes. If you are married or single you will feel right at home in our adult dance classes in Reading Pa as both singles & couples are well represented! 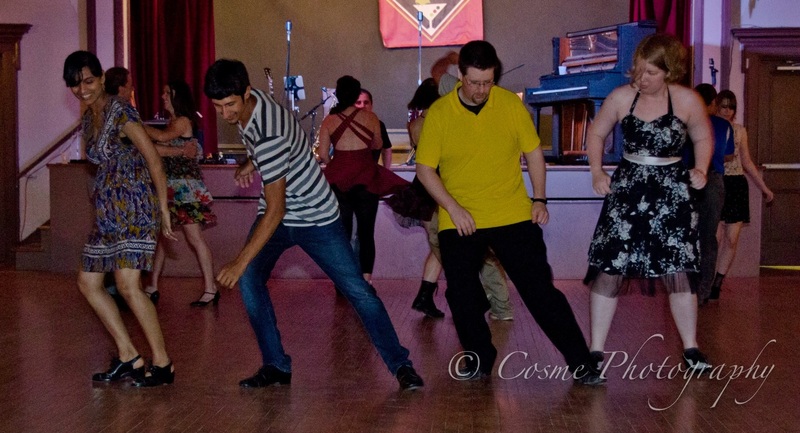 Swing Kat based in Pottstown Pa has been teaching vintage swing dance styles since 2006. Now we bring our years of experience to Reading Pa! Perhaps you like having fun and have found other adult dance classes in Reading Pa to be well, stuffy… Well, you won’t find that at Swing Kat dance studios. First off, swing dancing is a carefree, free-form or street style of dancing. It is characterized by wild high energy movements that make you feel free and cause you to drop your inhibitions. Secondly, we encourage fun and keep our classes that way too. We understand that some students don’t care as much about dancing as they do about just getting out to have a good time meeting other people. So, we keep our class fun and friendly. If you have thought about adult dance classes in Reading Pa, swing is where you want to start and Swing Kat is who you want to start with! Come check us out and meet our very talented young instructor Stephen Mark Cody! Bobby White Workshop with Jen Barnett! Many of our higher level dancers here at Swing Kat have been asking me about having Pro dancer/instructors come in to teach workshops. Those who know what I have been through in the past two years, know why it has taken me so long to get to this point (running a business has it’s challenges). But the day has come and a Bobby White workshop is very fitting. Bobby White is a great instructor. There are pro dancers who I wouldn’t say that about. But Bobby is both an excellent instructor and an excellent dancer. If we are having a “Bobby White Workshop” than Bobby needs an instructing partner. Well, not any follow would do this go around. Instead my long time friend and long time supporter of Swing Kat Jen Burnett offered to come help! Jen is also a pro dancer and an awesome instructor! With these two instructors this workshop is going to be something you don’t want to miss! The Bobby White workshop will happen on August 8th, 2015. It will include 3 hours of dance instruction in Balboa/Balswing! Admission of $60. will cover the workshop and your evening dance admission! The instruction will be Intermediate – Advanced in level. Dancers should be able to comfortably do moves such as Come A Rounds, In & Outs, Send Outs, Etc. WORKSHOP SIZE IS LIMITED TO 15 COUPLES… Sign Up Today! Reading Dance Lessons Start Off With The Tranky Doo! It has been a long time in the making, but Reading Dance Lessons are finally here! In less than 2 weeks, Swing Kat Entertainment based in Pottstown Pa will be opening it’s latest satellite location at the Goggle Works in Reading PA! The dance studio will be run by no other than Swing Kat’s Stephen Mark Cody. 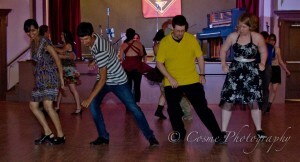 Mark started dancing at Swing Kat a few years ago and quickly mastered many of the vintage swing dance styles. Under direction from Swing Kat management Mark has been working on instructing and has proved to excel in not just dance but his ability to teach it as well. If you have been looking for Reading dance lessons and vintage swing dancing looks like a bunch of fun, don’t wait get in on the action! Swing Kat though starting it’s Reading satellite with Introduction classes for first time dancers has also decided to do something for it’s higher level students who are within driving distance of Reading. So, to celebrate the opening of it’s new satellite location, Swing Kat will be offering a 10 WEEK Specialty Session on the Tranky Doo! The Tranky Doo is a vintage jazz routine from the 1930’s. It is much like the Shim Sham Shimmy which is very popular in swing dance clubs around the world. However it is more difficult and includes a longer list of jazz moves. Knowing the Tranky Doo will make you one popular swing dancer and you can learn it now! Lansdale Swing Dance Classes are coming to North Penn YMCA’s Lansdale Area Family YMCA this fall! For many years the Y in Lansdale has hosted ballroom style dance lessons through the Ballroom, Latin & Swing Dance Center run by Vivian Beiswenger. Vivian a long time associate and friend of mine called me this past spring to let me know she was letting the program go. This would mean that many ballroom dancers would be left without an outlet for learning dance in the Lansdale area. She didn’t want this and thought that if anyone could pull off holding the program together it would be me. Like I said the Y in Lansdale has been the home of ballroom style dance lessons. So having Lansdale swing dance classes will be something new added to the mix. In the ballroom styles of dance you have East Coast Swing and West Coast Swing, however these are not the styles we handle in Vintage swing dancing. 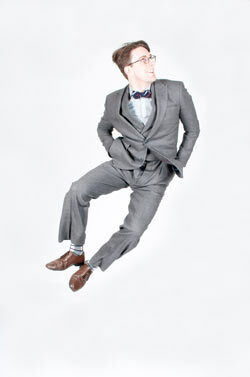 Our styles include Lindy Hop, Jitterbug, Balboa, Charleston and Collegiate Shag. So Lansdale swing dance classes will be something totally new for the dancers of the Lansdale area. Our Lansdale swing dance classes will take place on Tuesday evenings. Be sure to keep your eyes open as we start to post these classes and give details! We have the ballroom style dance lessons covered as well through Lynn Kettenburg of Victory Fitness & Dance Center Inc. in Emmaus PA. Lynn has agreed to run Monday evening ballroom dance lessons for the Lansdale Area Family YMCA. This is great news as the dancers that currently support the Y’s dance lessons are ballroom dancers. This should help us get Lynn’s lessons off the ground quickly! So, are you ready for Lansdale swing dance classes? Click here for more information on our Lansdale Dance Studio. Also be watching our Classes Page for the first scheduled classes! The best laid plans of mice and men often come across road blocks that demand a detour. That is the case for our swing dance classes near Allentown PA scheduled to start in mid-May. As it turns out, I have found out that there is a group 20 minutes from our Allentown area location (Emmaus PA) meeting in Fountain Hill PA which is also doing vintage swing dance related events. I first heard of their operation about 3 weeks ago now. However I had trouble finding information on their dance classes near allentown pa and figured that it was just a ballroom dance studio giving some vintage swing lessons. So I was not very concerned about moving forward and planned to stay the course. However, last weekend I found out that was not the case. The couple putting on these events are vintage swing dancers all the way! Since our classes were scheduled for Thursday nights & their events have been happening on Thursday night for the past 2 years, I have decided to change our dance classes near allentown pa to another night. It is the right thing to do. The world of vintage swing dancing is very small compared to the world of ballroom dancing. Those of us who work hard to give the rest of you places to enjoy such activities need to work together. For this reason and the fact that having both Swing Kat and this group in the Allentown area only makes vintage swing stronger in that region, we will be switching our night. I have spoken with Lynn Kettenburg of Victory Fitness & Dance as well as our instructor Michael Clemmer and we were able to come up with a night that works. So, now with a month and a half to go until the big show our classes have been moved to Monday evenings. I hope you can make it if you are from the Allentown area! Classes start on May 12th 2014! Plans have been underway since the end of 2013 to have satellite swing dance studio locations throughout the greater Philadelphia area. This has long been an idea floating in the back of my head, however it took extreme circumstances to bring about this awesome new direction for Swing Kat! After much planning and work, I am very happy to announce our first satellite dance studio location just south of Allentown Pa. Our swing dance studio home for the Allentown region will be located in Emmaus PA where miss Lynn Kettenburg runs Victory Fitness & Dance Center Inc. Lynn has been a long time partner with Swing Kat in the area of ballroom dancing. However Lynn also teaches children’s Tap, Jazz and Ballet classes. Lynn is an incredible dance instructor and a truly delightful person to work with. Lynn currently teaches the ballroom styles of dance in partnership with Swing Kat at the Sunnybrook Ballroom. She has now opened her doors to us to come use her dance studio for vintage swing dance classes on Thursday evenings! I know many great dance professionals in the Allentown area, but I can’t think of a better person to partner with in this region. You may ask, “Who will be teaching these dance lessons?”. It is a fair question. Obviously with 7 total locations planned to open in the next calendar year I can’t be the instructor at every studio. However I have been in talks with some of the greatest dancers/instructors from around the Philly region! One of these instructors is our very own home grown dancer Michael Clemmer! Michael’s bio can now be found on our instructors page. Michael knows how to keep things fun while giving valuable insight to his students. Anyone who lives in the Allentown area is in for a real treat having Michael as their instructor. Our Allentown area classes start on May 15th 2014! The first 5 week series is one that most people reading this blog don’t need to take, however Introduction To Swing Part #2 starting on Thursday June 19th in Emmaus would be great for even experienced swing dancers. Take a look at what we will be offering on our dance syllabus page and get excited about dance lessons in Allentown! How did we come to a new focus on swing dance lessons? Swing Kat Entertainment has just come out of a large transition which has forced us to re-examine our mission in the greater Philadelphia area. When Swing Kat was founded in August of 2006 the goal was simple, make a place to dance an hour north of Philly where I (Faryl) lived. Driving to Philadelphia, York Pa and Washington DC just to go dancing for a night was really starting to wear on me but my love for swing dancing & Swing dance lessons was not fading. My closest option was the Philadelphia Swing Dance Society in Mt Airy. Often this drive took between 55 & 75 minutes due to heavy traffic. The drive home was often a sleepy accident waiting to happen. But nothing compared to the drives home from York or Washington DC. Thus Swing Kat was born! At the beginning Swing Kat was all about holding swing dance events not swing dance lessons (other than the swing dance lessons before each dance event). However due to the fact we had a monthly rent to pay and that the Ballroom On High mostly sat empty throughout the week, we soon expanded our program to include swing dance lessons, then ballroom dance & 1st Friday Mix events, then ballroom dance classes, then salsa & country dance events, then salsa classes and Argentine Milonga Dances. In the end we added private rentals of our beautiful facility and split everything that didn’t swing from Swing Kat and re-organized it under Ballroom On High LLC. With our move from the Ballroom On High came a new chapter and a whole new set of ideas and directions in which to go. No longer was it possible to hold weekly swing dance events due to our high standard in venue choices and the cost with which they could be secured. It was time to seek out a new direction and formulate new ideas for the future of Swing Kat Ent. Swing Dance lessons in your area! Swing Kat Entertainment’s goal still remains the same, to provide swing dance events in the Pottstown region. This goal is met through our 1st Saturday DJed Swing Dances & our 3rd Saturday Live Band Events. However, our goal has expanded in the area of swing dance lessons and classes. Our goal between now and January 2015 is to add 6 new locations where you can learn to swing dance! We know that many in our dance family cannot make it to our dance lessons in Pottstown during the week or on Tuesday nights. Many of you drive to Pottstown the way I used to drive to Philly for our events. So, Pottstown is just to far for most of you. However, If you live within 90 minutes of Pottstown (which most of you do) you will now have Swing Kat swing dance lessons within 45 minutes of where you live! The towns in which you will find us by January of 2015 are as follows; Allentown, Ardmore, Reading, West Chester, New Holland and Souderton! By June of 2014, our first two new dance studios will open. We have already secured a facility in Emmaus near Allentown and in a new dance studio opening in Ardmore hopefully. Our instructors for these locations have been selected and will be announced shortly. We currently have been in talks with a total of 4 dance instructors who are all on board to make this new direction for Swing Kat a reality! That makes 5 really awesome dancers/instructors who not only know their stuff, but know how to teach it as well. Hope to see you in class by 2015!